Interstellar travelers might want to detour around the star system TW Hydrae to avoid a messy planetary construction site. Astronomer David Wilner of the Harvard-Smithsonian Center for Astrophysics (CfA) and his colleagues have discovered that the gaseous protoplanetary disk surrounding TW Hydrae holds vast swaths of pebbles extending outward for at least 1 billion miles. These rocky chunks should continue to grow in size as they collide and stick together until they eventually form planets. "We're seeing planet building happening right before our eyes," said Wilner. "The foundation has been laid and now the building materials are coming together to make a new solar system." Wilner used the National Science Foundation's Very Large Array to measure radio emissions from TW Hydrae. He detected radiation from a cold, extended dust disk suffused with centimeter-sized pebbles. Such pebbles are a prerequisite for planet formation, created as dust collects together into larger and larger clumps. Over millions of years, those clumps grow into planets. "We're seeing an important step on the path from interstellar dust particles to planets," said Mark Claussen (NRAO), a co-author on the paper announcing the discovery. "No one has seen this before." A dusty disk like that in TW Hydrae tends to emit radio waves with wavelengths similar to the size of the particles in the disk. Other effects can mask this, however. In TW Hydrae, the astronomers explained, both the relatively close distance of the system and the stage of the young star's evolution are just right to allow the relationship of particle size and wavelength to prevail. The scientists observed the young star's disk with the VLA at several centimeter-range wavelengths. "The strong emission at wavelengths of a few centimeters is convincing evidence that particles of about the same size are present," Claussen said. Not only does TW Hydrae show evidence of ongoing planet formation, it also shows signs that at least one giant planet may have formed already. Wilner's colleague, Nuria Calvet (CfA), has created a computer simulation of the disk around TW Hydrae using previously published infrared observations. She showed that a gap extends from the star out to a distance of about 400 million miles - similar to the distance to the asteroid belt in our solar system. The gap likely formed when a giant planet sucked up all the nearby material, leaving a hole in the middle of the disk. Located about 180 light-years away in the constellation Hydra the Water Snake, TW Hydrae consists of a 10 million-year-old star about four-fifths as massive as the Sun. 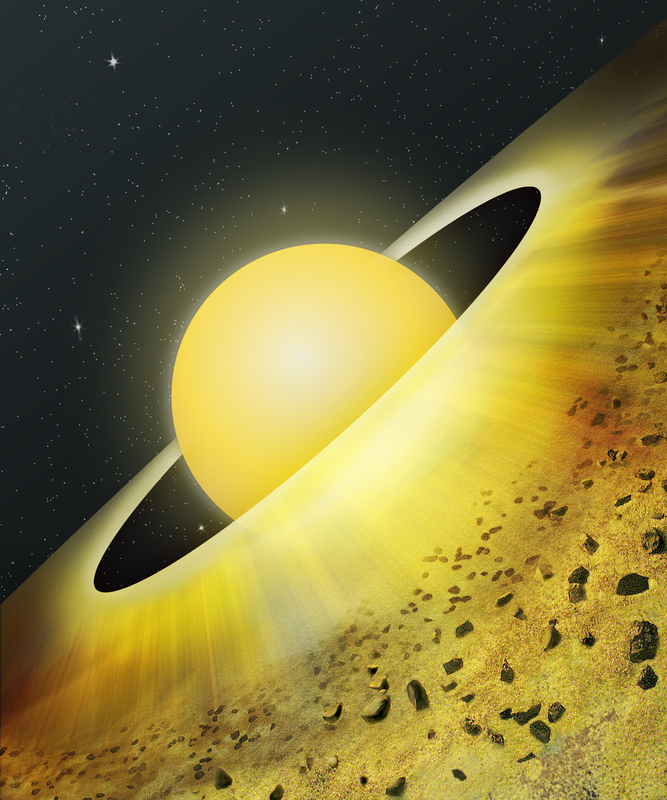 The protoplanetary disk surrounding TW Hydrae contains about one-tenth as much material as the Sun -- more than enough to form one or more Jupiter-sized worlds. "TW Hydrae is unique," said Wilner. "It's nearby, and it's just the right age to be forming planets. We'll be studying it for decades to come." This research was published in the June 20, 2005, issue of the Astrophysical Journal Letters.